Small, blocky shapes of towns, fields, and pastures surround the graceful swirls and whorls of the Mississippi River, the largest river system in North America. Today, on the 40th anniversary of the launch of the first Landsat satellite, scientists and government officials took time out to commemorate the technology that's revealed our world in a whole new light. "The Landsat program has given each and every one of us in every part of the world a thoroughly objective, continuous look at ourselves in the mirror since 1972," Anne Castle, assistant secretary for water and science at the U.S. Department of the Interior, said during a news briefing at the Newseum museum in Washington, D.C. The latest, most technologically advanced Landsat satellite, the Landsat Data Continuity Mission (LDCM), is due to launch in February 2013 from Vandenberg to beam home even more amazing pictures of Earth from space. "Landsat has really become the gold standard of remote sensing from space," Castle said. "It's provided an invaluable, indelible record of the recent history of our planet." The satellites have documented some jaw-dropping beautiful sights on planet Earth, such as streaky sand dunes in Algeria, the skull-like shape of Lake Eyre in Australia, and swirling phytoplankton in Sweden that recall Van Gogh's painting "Starry Night." Swirls of yellow streak a deep blue sea around a long island In the style of Van Gogh's painting "Starry Night," massive congregations of greenish phytoplankton swirl in the dark water around Gotland, a Swedish island in the Baltic Sea. Landsat has also shown the grimmer side of Earth, particularly changes wrought by humans through construction and climate change. For example, satellite images show fast-retreating glaciers in Alaska, urbanization around Beijing, China, and a significant loss of rainforests in Brazil. "It's really by stepping back and looking at the Earth, observing these changes in their context from space, can we really understand what's happening," said NASA chief scientist Waleed Abdalati. 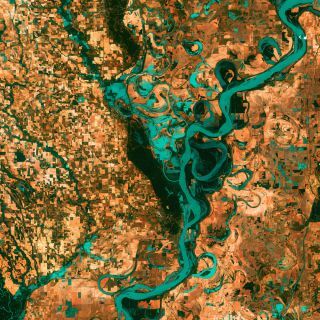 In honor of the Landsat anniversary, scientists chose the 10 most significant images captured by the satellites over the years. These include a photo of the eruption of Washington State's Mount St. Helens volcano in 1980, a picture of the burning oil set afire by withdrawing Iraqi forces in Kuwait in 1991, and images that formed the first high-resolution, true color map of Antarctica in 2007. The Landsat program is a collaboration by NASA and the U.S. Geological Survey, an agency of the Interior department. Scientists estimate it costs about 80 cents per U.S. citizen per year, over the lifetime of the program. "Landsat has given us a critical perspective on our planet over the long term and will continue to help us understand the big picture of Earth and its changes from space," NASA Administrator Charles Bolden said in a statement. "With this view we are better prepared to take action on the ground and be better stewards of our home."